What's up with all of the clothing symbolism in parashat vayeshev? 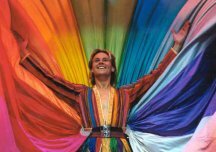 First we learn that haute couture can inspire powerful responses: Joseph's Amazing Technicolor Dreamcoat makes his brothers so jealous they sell him into slavery. Then there's the outer garment which Potiphar's wife grabs as she orders him to lie with her -- which, when he flees, tears away and is left in her hands, the "proof" she uses to condemn him. As this commentary notes, Joseph gets a costume change to match every change of his fortunes. Like Clark Kent tearing off his mundane garb in a phone booth, Joseph changes his look every time he enters a new role. The Hebrew for the multicolored coat is כתנת פסים (k'tonet pasim); the word in the Potiphar story is בגד (beged), "garment." A quick dip into my Brown-Driver-Briggs tells me that the three-letter root בגד means "garment, clothing, raiment, robe" when it's a noun...and "act or deal treacherously" when it's a verb. Okay, there's definitely something interesting happening here. Potiphar's wife's attempted treachery (בגד) leaves her with a robe (בגד) in her hands. And though Joseph's tunic isn't a בגד it leads to his brothers' betrayal, hinting at the synonym for clothing that the text doesn't use. Reb Tirzah Firestone notes here that another figure in Torah wears a k'tonet passim: Tamar, also violated by a sibling. "These Technicolor coats carried some heavy karma," Reb Tirzah writes. "In both stories, the jackets are the props spelling specialness that ends in sibling violence." She sees special resonance in Joseph's shift from k'tonet to beged: the k'tonet is "the garment of our identification, our story line. Our story might be about our greatness; it might be about how much we have suffered or the way in which we have uniquely suffered, it doesn't matter. These identities, like the k'tonet passim, keep us special and hence, keep us separate." Joseph relinquishing that garment -- and, later, relinquishing his beged in order to keep his honor -- is a sign of his transformation. Scott, a rabbinic student I met at Elat Chayyim last summer, spun a drash on the root בגד: that our clothes, the externals we don before venturing into the world, can disguise our true selves. In this sense, the professional or personal armor in which we gird ourselves is a kind of treachery, a concealment of our vulnerability before each other and before God. Indeed, this commentary argues that "BeGeD is one of Torah’s great puns; its very root means betrayal and deception, for the role of clothing is to hide and conceal." So is Torah trying to subtly suggest that we all become nudists? Doubtful. Meaningful though it may be that mikvah immersion, for instance, is done naked -- a way of being present to God's Presence without any external stuff coming between us -- life can't be lived in that kind of immersive connection all the time. But this week's story reminds us that though our garments can say things about who we want to be, they can also cause trouble...and that our actions, whatever they may be, speak louder than the robes we (do or don't) wear. Technorati tags: religion, Judaism, Torah, vayeshev.